The change in temperature has given me an opportunity to cook some robust warming food that I’ve had in my mind during hot summer. Yes, making casseroles, stews and soups and baking! That’s why my oven has been so busy every day. Polenta is grounded corn meal – both gluten-free and wheat-free. It is rich in carbohydrates and insoluble fibre, low GI (stabilising your blood sugar level) and contains a good range of vitamins and minerals. It is so versatile to use. When you cook in a pot and serve immediately, it is like mashed potatoes, a creamy base for stew or casserole. Then it transforms to a hard block when it’s set in the fridge. You can cut into little cubes, pan-fry and add into your salad, just like croutons. You can also cut into squares or rounds, add your favorite toppings and make gluten-free crostini. 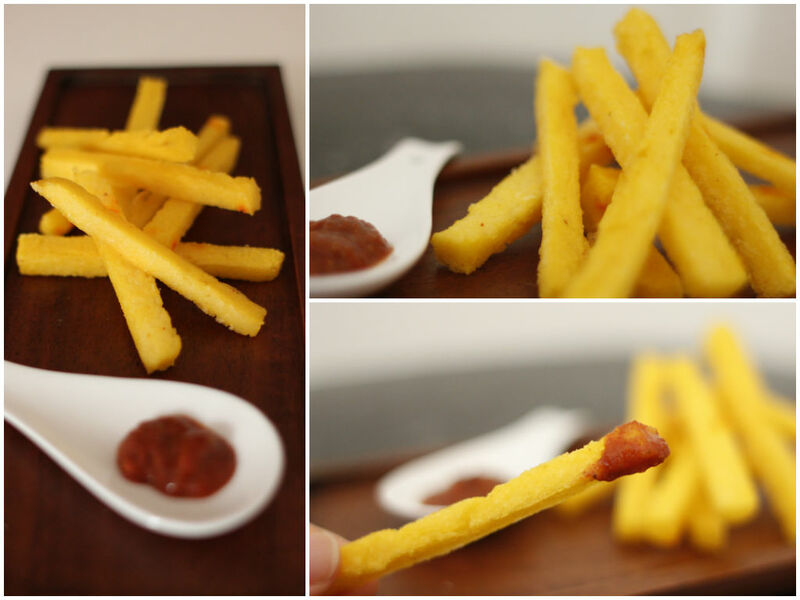 Or you can cut into strips and make this healthy oven-baked polenta chips. How to cook? I add a cup of polenta in a sauce pan and pour 4 cups of water. Turn on the heat, bring it up to a boil, simmer over low heat for 20-30 minutes. You need to keep stirring making sure there is no lumps, and add a bit of more water if the mixture is too thick. Don’t forget to season or add some flavours such as using stock or milk instead of water, adding grated Parmesan cheese and adding in some herbs. It is actually not as hard as it sounds. You just need to get the consistency and seasoning right. Once it is cooled down and set in the fridge, take it out and cut into little strips. Season and spray some oil. Bake in the oven for 20-30 minutes, flipping half-way through. It should be golden brown outside and fluffy inside. As the baking process drives moisture from the polenta, the flavour will be more concentrated and corn-y. It is a healthy alternative to normal deep fried potato chips at your dinner table. Also a great afternoon snack when you feel like something but not quite dinner yet. Or serve as a savoury nibble when your guests arrive at the dinner party? Serve with herb-y salt like rosemary or sage, tomato-chili sauce, chive-cottage dip, or sun-dried tomato humus.